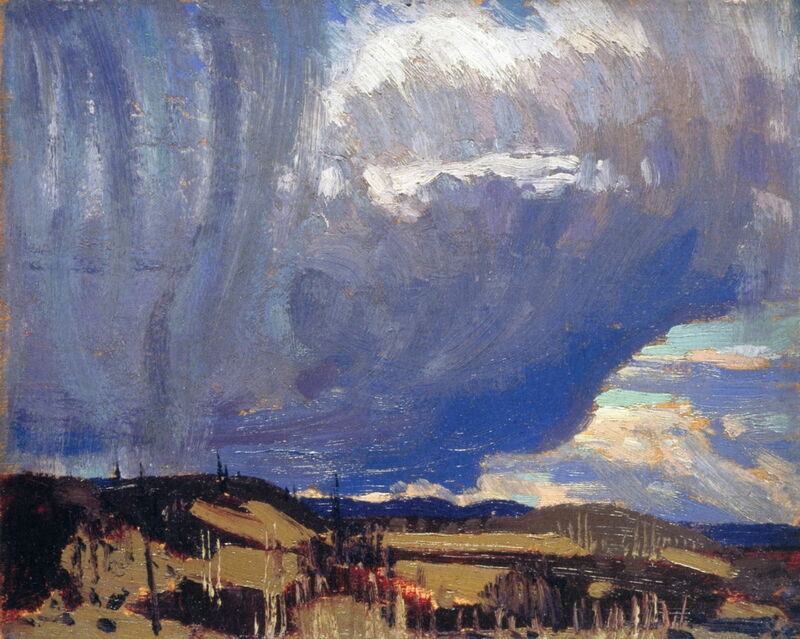 Tom Thomson (1877–1917), Approaching Snowstorm (1915), oil on board, 21.3 x 26.6 cm, National Gallery of Canada / Musée des beaux-arts du Canada, Ottawa, ON. The Athenaeum. This article is the second and concluding part of my summary of Tom Thomson’s many paintings made during 1915, a year in which he painted a great deal in Algonquin Park. There are still two more articles to come completing his whole career, though. Thomson’s image of the rugged outdoorsman canoeing in wild country is a crude simplification. During his childhood, he had a keen interest in natural history, and he developed this in his paintings too, making many works showing the beautiful wild flowers of Canada in their natural setting. Tom Thomson (1877–1917), Marguerites, Wood Lilies and Vetch (1915), oil on wood, 21.4 x 26.8 cm, Art Gallery of Ontario, Toronto, ON. Wikimedia Commons. Marguerites, Wood Lilies and Vetch (1915) shows these wild flowers against a black background, with frequent small patches of ochre ground showing through. The marguerites are the large daisy-like flowers, sometimes known as ox-eye daisies; the wood lilies are bright orange and red, and the vetch are the small blue flowers clustered in linear arrays. 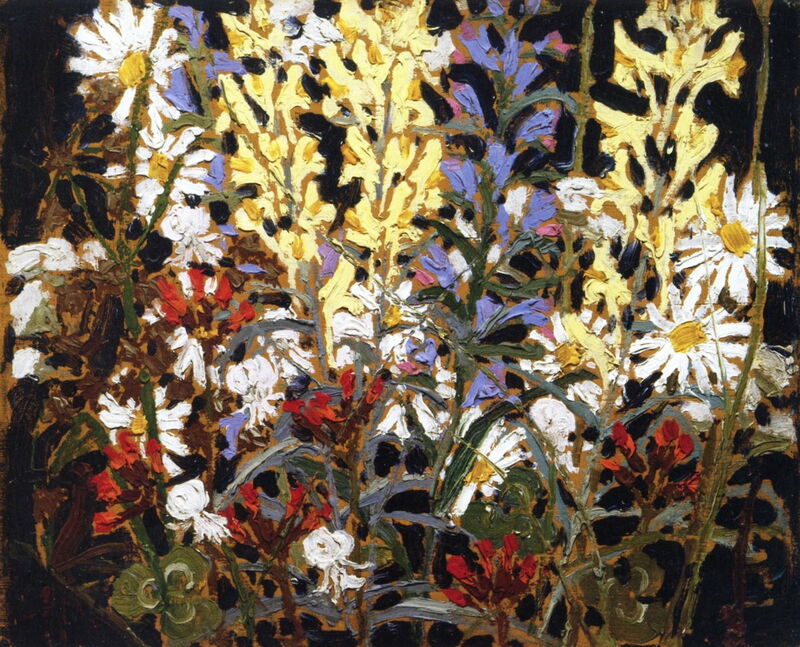 Tom Thomson (1877–1917), Wildflowers (1915), oil on composite wood-pulp board, 21.6 x 26.8 cm, McMichael Canadian Art Collection, Kleinburg, ON. The Athenaeum. 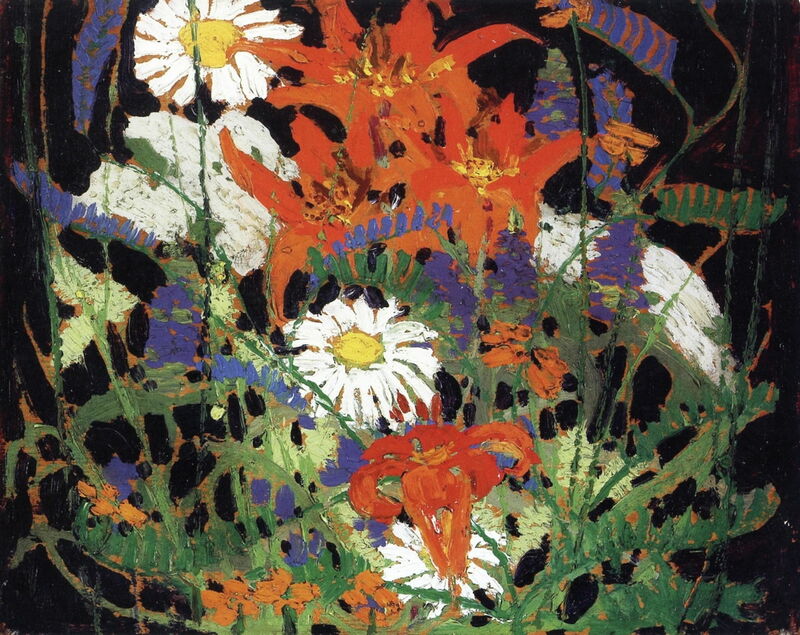 Wildflowers (1915) is a collection of marguerites and at least four other species of wild flower, again shown on a black background with more extensive areas of ground showing through. 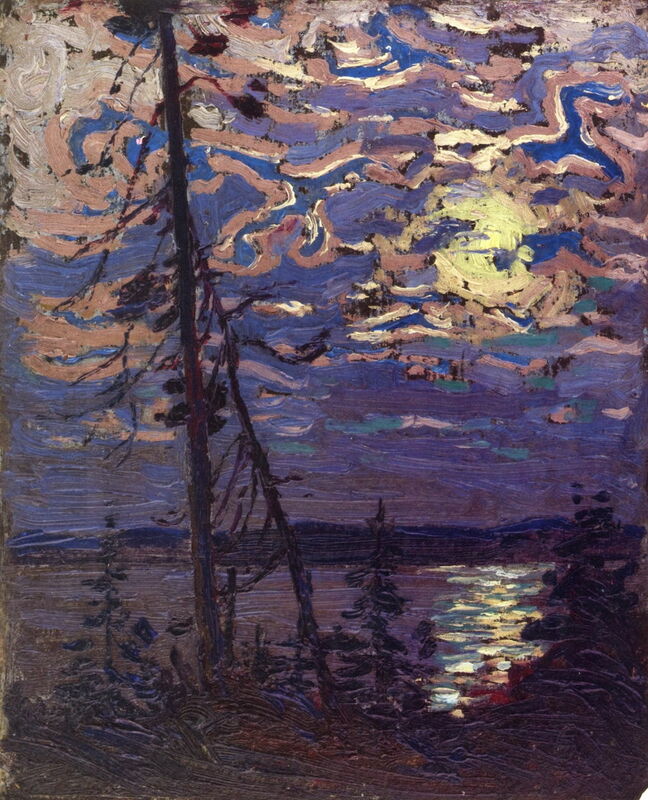 Tom Thomson (1877–1917), Moonlight (1915), oil on composite wood-pulp board, 26.4 x 21.6 cm, Private collection. The Athenaeum. Although Thomson often painted nocturnes from his canoe, Moonlight (1915) appears to have been painted from the land, looking over Canoe Lake in Algonquin Park, perhaps. His earlier linear brushstrokes of colour used in the sky are here curved and twisted with the cloud edges, only becoming linear again lower down towards the horizon. 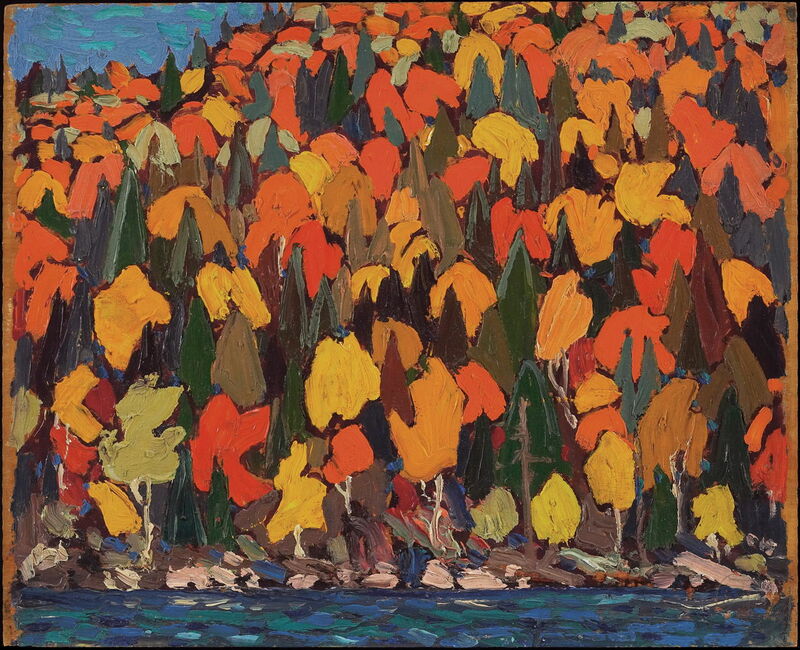 Tom Thomson (1877–1917), Autumn Foliage (1915), oil on wood, 21.6 x 26.8 cm, Art Gallery of Ontario, Toronto, ON. Wikimedia Commons. 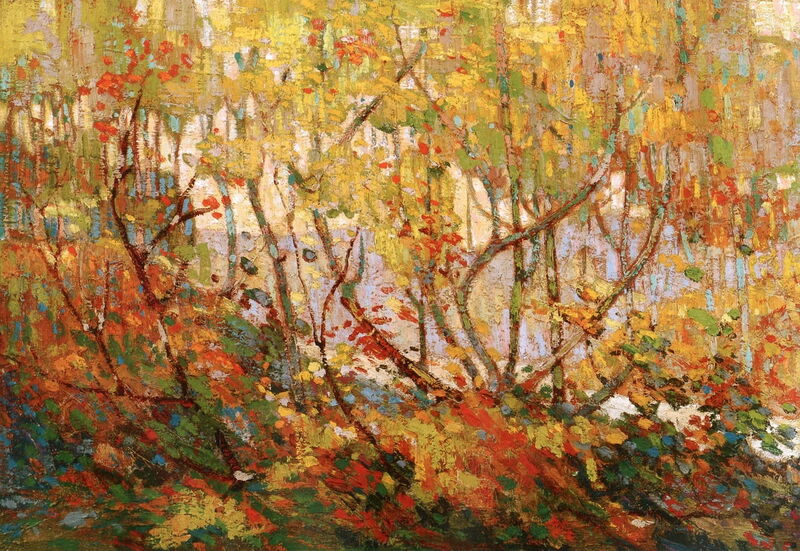 In Autumn Foliage (1915), Thomson has taken the time to form the canopy of each tree individually, resulting in an unusual rhythmic pattern of autumnal colours. Tom Thomson (1877–1917), Sketch for Autumn’s Garland (1915), oil on composite wood-pulp board, 21.6 x 26.7 cm, Private collection. The Athenaeum. 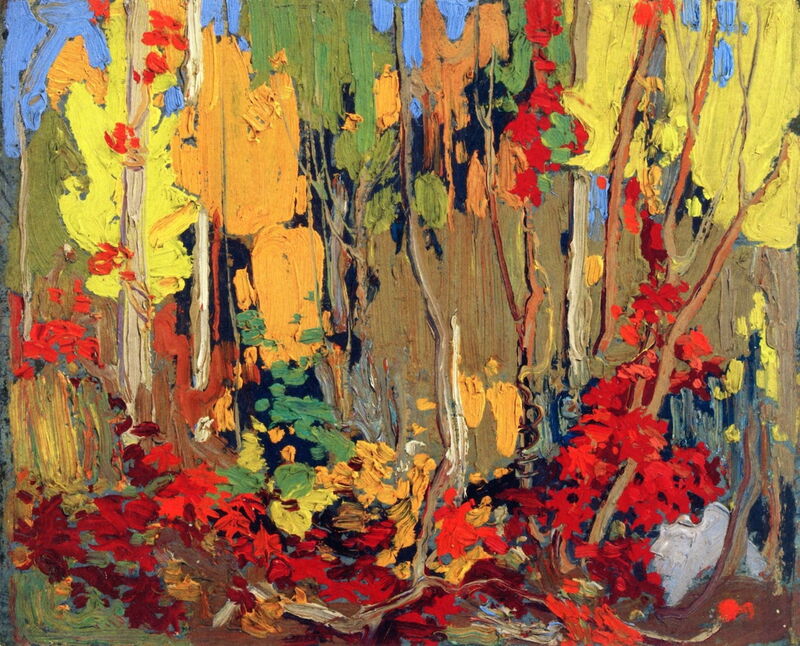 Sketch for Autumn’s Garland (1915) shows a very different approach to rendering the colours of autumn. Tom Thomson (1877–1917), Autumn’s Garland (1915-16), oil on canvas, 122.5 x 132.2 cm, National Gallery of Canada / Musée des beaux-arts du Canada, Ottawa, ON. The Athenaeum. 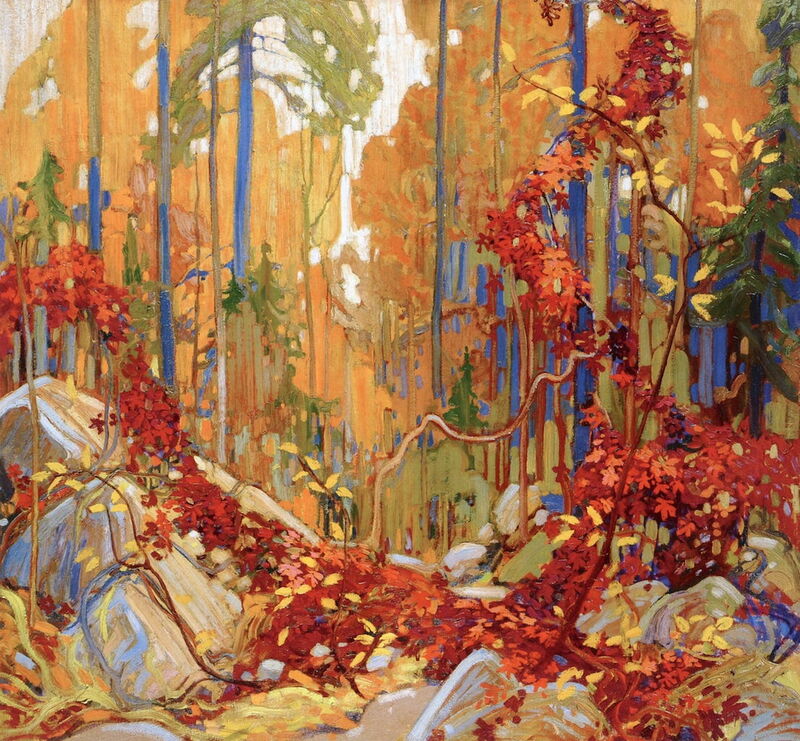 During the following winter, when he was back in his studio in Toronto, Thomson developed that plein air sketch into a large painting on canvas: Autumn’s Garland (1915-16). This is considerably more detailed than his original sketch, but has now lost his early fine realism, with passages containing more painterly effects and marks, such as the rocks in the foreground. Tom Thomson (1877–1917), Opulent October (1915-16), oil on canvas, 54 x 77.3 cm, Private collection. The Athenaeum. Opulent October (1915-16) is a slightly smaller canvas, which Thomson painted in the studio. His approach here is different again from that in Autumn Foliage and Autumn’s Garland: the canopy is built more anatomically on the branches, with irregular small daubs of colour placed on top of those to create the effect of clusters of individual leaves. 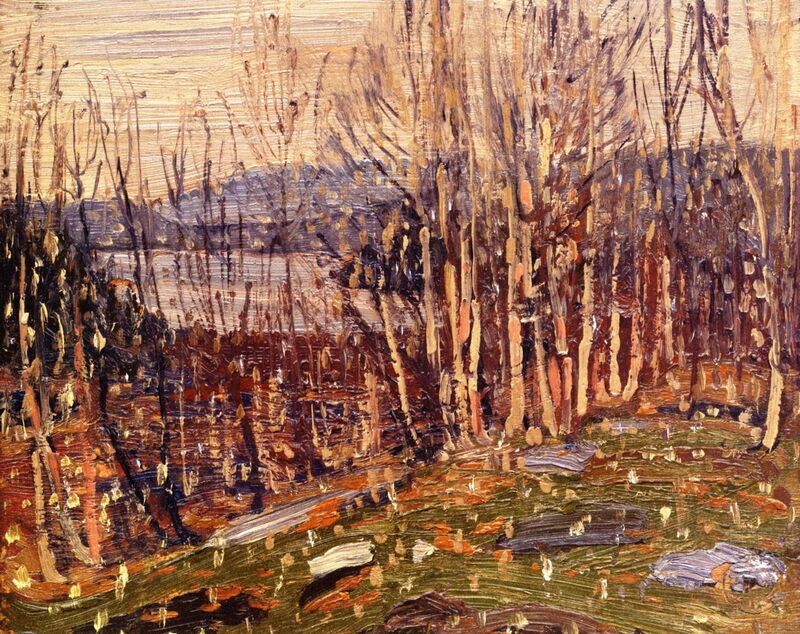 Tom Thomson (1877–1917), First Snow, Canoe Lake (1915), oil on board, 20.3 x 27 cm, Private collection. The Athenaeum. First Snow, Canoe Lake (1915) shows another transient effect of the weather, as large snowflakes are falling heavily in the late autumn. Thomson was a great opportunist when there were ephemeral events, such as dramatic changes in the weather. His Approaching Snowstorm (1915) would have been painted as others were hurrying for shelter from the coming storm. He would dash out with his painting gear and spend the next twenty or thirty minutes completely absorbed in capturing the scene. 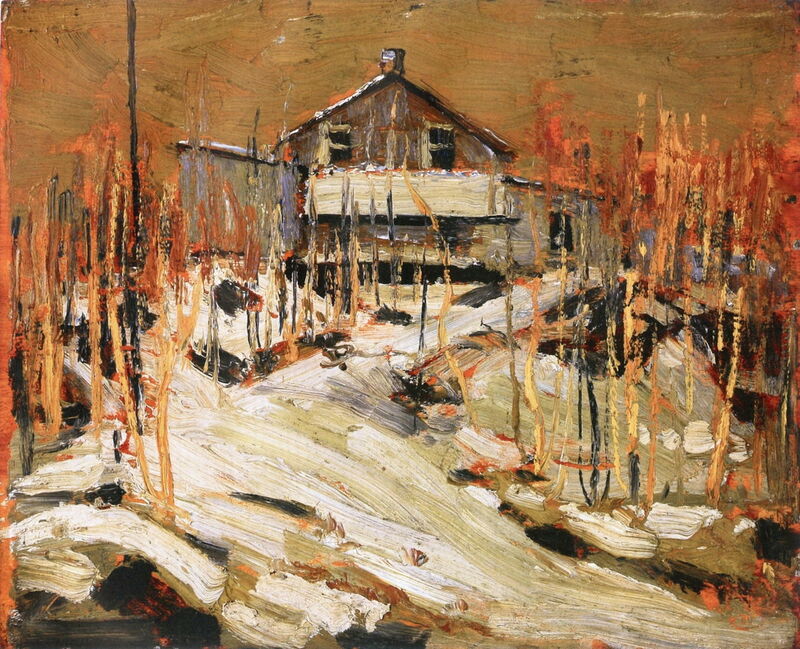 Tom Thomson (1877–1917), Fraser’s Lodge (1915), oil on wood, 21.9 x 27 cm, Art Gallery of Alberta, Edmonton, AB. The Athenaeum. Another painting from Algonquin Park, Fraser’s Lodge (1915) may show part of Mowat Lodge, in the small hamlet of Mowat. This grew from a logging camp which had been established in the nineteenth century. At the time, Shannon Fraser was the owner of Mowat Lodge, hence the name used here. It was a base for dinghy sailing, one source of the abundant verticals shown. This view was probably painted in the late autumn, with the brilliant flame-coloured foliage still visible in the trees in the background, after the first snowfall of the coming winter. Tom Thomson (1877–1917), Forest Undergrowth I (1915-16), further details not known. Wikimedia Commons. 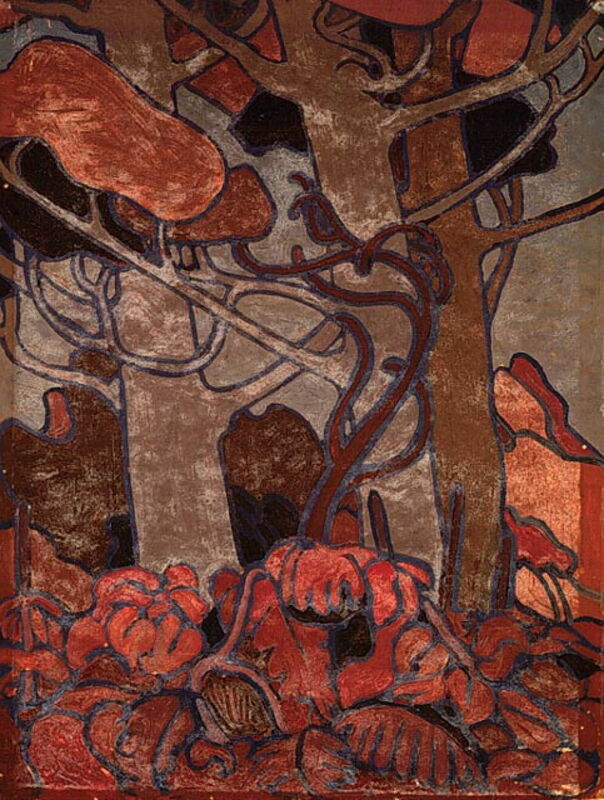 Thomson also painted some more decorative work, including a series based on different forms seen in the woods, of which Forest Undergrowth I (1915-16) is the first. This appears to have been among the panels destined to be installed in Professor MacCallum’s cottage on Georgian Bay, whose completion was among the artist’s highest priority tasks during the winter of 1915-16. David P Silcox (2015) Tom Thomson, Life & Work, Art Canada Institute. Available in PDF from here. Posted in General, Painting and tagged Canada, Group of Seven, landscape, painting, plein air, Thomson. Bookmark the permalink.